I’m an educated mathematician and in the meantime I work since more than 20 years in the pharmaceutical industry. When I started my career, SAS was actually the only option for me as a programming language to prepare tables, listings and figures. I would call myself a seasoned SAS-Programmer, although I don’t program a lot anymore. Nowadays everybody is talking about Data Science and our Educating for the Future: Data Engineering project is an important puzzle piece in this Data Science section. Within this project, I became quickly aware that the programming language Python is one of the options to choose for data engineering or data science tasks. The research into the data engineering topic raised more and more my interested and I wanted to learn more about Python. My preferred educational method is still to start reading a book, but there are countless books available. 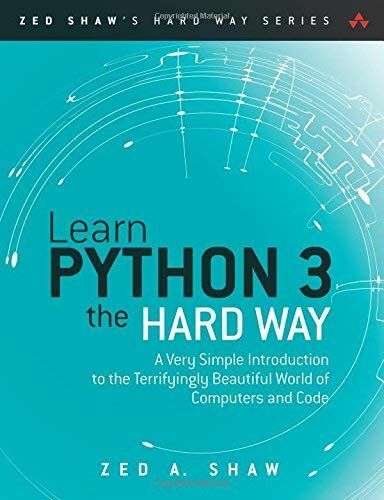 Due to my day job, I was looking for a book, which is easy to read, easy to follow and does not require any pre-experience with Python. The book, which really caught my interest, was Learn Python the Hard Way from Zed Shaw. This book gives an excellent introduction into Python. The author Zed Shaw wrote the book in several and very short exercises, which the reader has to follow. Each exercise consists of some code, which the user needs to type into his or her computer. Starting from the usual “Hello World” example, the exercises introduce different methodologies and become more advanced from exercise to exercise. Each exercise ends with some study drills, which help to further dive into the specific topic. Drills also contain to do some web searches, to learn more about some syntax. With this, the book allows a lot of interactivity, which I prefer when I dive into a new topic. Sascha is an educated mathematician and has more than 20 years experience in the pharmaceutical industry. In his day job, Sascha leads the global Statistical Programming and Analysis group at Bayer AG. He is a member of the PhUSE Board of Directors and fills the position of the global Communications Director since the year 2013. If you are interested in our up to date news and information, check out our Data Engineering Blog. Here we review books or other resources, introduce new software versions or write about interesting events around the topic Data Engineering.